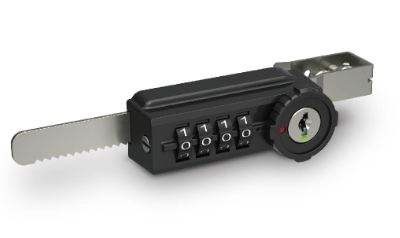 SEATTLE, WA -- FJM Security Products is proud to announce an updated style of the Combi-Ratchet, sliding door combination ratchet lock now with 4-dials and 10,000 possible combinations! The sliding door lock offers keyless convenience for a variety of uses such as retail display cases, trophy cases, showcase displays, etc. The Combi-Ratchet, retail display case lock, is great for retail scenarios where key management is an issue with employees leaving or forgetting their combination. Employees can set their own codes and the manager controls all locks with one master key. The master key allows code discovery and the ability to change to a new combination if employees quit or forget their code. The combination ratchet lock works on material up to 7/16” thick. The 4-dial sliding door lock has 10,000 possible combinations, pick resistant dials, and dual access (with combination or master key). Combi-Ratchet, sliding glass door lock, was designed with extremely tight clearances to resist shims and other picking tools. FJM Security Products’ (FJMSecurity.com) mission is to supply resettable combination security devices and other quality hardware products in a manner that exceeds our customers’ expectations for value, service and innovation. Our other products include Combi-Cam Cabinet Lock Series, Padlockable Cam Locks, Combi-Bolt Combination Bolt Locks, SOBO High Security Padlocks, ShurLok and KeyGuard Key Storage, HitchSafe, and other keyed cabinet locks. FJM Security Products, a division of Frank J. Martin, has been in business since 1957.